Hi Sam from the middle of the Mekong river! Last year Chris and I went to Laos and spent a few relaxing days in Vientiane. The French ran it in the days of colonies, so the coffee and cake were superb, although the coffee was so strong it felt like someone had ripped your chest open and applied jump-leads to your heart. One evening we watched the sun set over the Mekong river – it was an enormous blood-red sun just like on the Japanese flag and as the river was out we could walk on the river bed without getting wet! Books coming out of our ears! We have now hit the magic mark of raising over £3000 from our ongoing book sales! £3082 to be exact! Wow! All those 50ps really do add up. In under two years this is a staggering total – who’d have thought it when we started the first box back in the early days etc etc. The queen in her counting house worked out that this year’s London Christmas craft sale and raffle raised a very healthy £729. The raffle draw, done two weeks, after the sale drew the crowds all clutching their lucky tickets. Hugh’s wonderful comparing and tray-shuffle presenting skills built the excitement of the draw. The lucky winners went home with their prizes (including Hugh who won the hamper from Alara – no fixing involved honest!) and everyone else vowed to win next time. And what of all those unwanted presents? We’ve all had a few I’m sure (anyone want a serving dish in the shape of a Christmas tree?)! We will be having an unwanted presents sale some time soon. Why don’t you organise one too in your office, school or community? Its a great way to recycle, raise money and have some fun. Last year we raised £840! Just a quick note to say thank you so much for Sam’s Christmas present – it was absolutely perfect. I love reading poems to Sam, and Kazumi and I are always searching for Japanese related books for him. Even though Sam says ‘I’m not Japanese, I’m English’ I’m determined he’ll be better at – Japanese than me… (though that’s not saying much!). It was so thoughtful of you – thank you very much. I hope you all had a lovely Christmas and New Year and it’s not too terrible to be back. It was so lovely to see you again before Christmas and it’s such a shame we missed some of you. Sam was overwhelmed by it all and very excited on the way back – we couldn’t get a word in edgeways! But I hope we can come up again soon as we have to come up for other reasons soon too and would love to pop in again. It was really really great to have such a warm welcome and we simply cannot express to you how much your help has been. It makes us feel welcome and not alone in this weird place we find ourselves. Sam had a lovely Christmas here. Lots of presents, lovely walks and he was so well and happy. Alex and Angela stayed for Christmas and Alex’s Mum and Dad came over and brought us two goldfish! The Aquarium makes a great place for Sam’s Playmobil diver and boat set! The fish get a bit freaked out though. 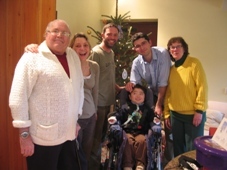 Alex and his family are Sam’s new extended family and he absolutely adores them. He was so overwhelmed on Christmas day by all the love and kindness he actually became quite emotional.. but then I think I would if I had just been given a playmobil aircraft set and tractor front loader! Sam is growing up so quickly and so intelligent and mischievous. Even over the last few lovely weeks of Christmas we have seen his mind race away with ways of getting more presents. One of his favourite sayings now if ‘if I’m a good boy now, can I have another present after dinner?. When he’s confident with people, even though Sam can’t move below his neck, he fills a room with his character and chat and it is an absolute joy to us to see what he will say next. All this from a boy that was given no chance of survival after the accident. He is our biggest Christmas wish every single moment! I hope the New Year brings peace and happiness to you all. Kazumi and I are happy if we both keep on breathing and walking every single day that brings us closer to Sam walking again – and we can rest assured that Sam will make sure that 2008 will be one hell of a wonderful ride! We have so many fun plans for 2008 – I hope you can all share them with us!